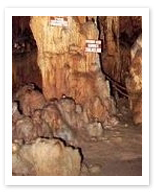 This “dripping stone cave” has somehow staked its claim as a favorite destination for visitors. Although, admittedly its claims to fame are many: constant high temperatures, dripping wet stalactites (the ones that hang from the ceiling), and 95% humidity, year around! On top of all that, this impressive cave, because of the density of the air inside, is held by many as a “magic cure” for asthma, though please don’t take that as genuine medical advice.